Christ was Dead - An ominous wind whistled on Calvary's hill and dried the blood stains on a cross, while the brokenhearted mourned the passing of their master. What remained now for his disciples and his loved ones? Nothing! All the brightness has gone out of their world, and for two long nights they tossed and turned with their broken dreams and their shattered hopes. Then the dawn broke forth and with it the electifying news: Christ is Risen! Incredible they said and they wouldn't believe it. Mary, the mother of James; Mary Magdalene; and Salome, the mother of John, rushing away from an empty tomb, trembling, astonished and afraid. Two disciples stumbling over each other in a race to the sepulchre to see if it were true. Nervous guards scampering back to the authorities with the unthinkable truth. Two travelers on the road to Emmaus amazed with the news. The startled, frightened disciples in Jerusalem who stood staring at a live man supposed to be dead. Christ had risen, and the crumbled dreams of the faithfull were reborn; and a new hope was let loose on the earth. Death is Conquered - Death is inescapable. Somewhere in this tenure of time, the curtain will drop on the first act. The heartbeat of each one of us will ebb into silence and stillness. All on earth shall keep an appointment with that moment when the candle is snuffed out, and life in the first world is through. What then? Christ is Risen! Believers Shall Never Die! - These short moments in eternity, spent here on the earth, are but the beginning of a greater pilgrimage which lies past the grave. We shall breathe the air of two domains. Because he lives, we, too, shall live, now and forevermore. 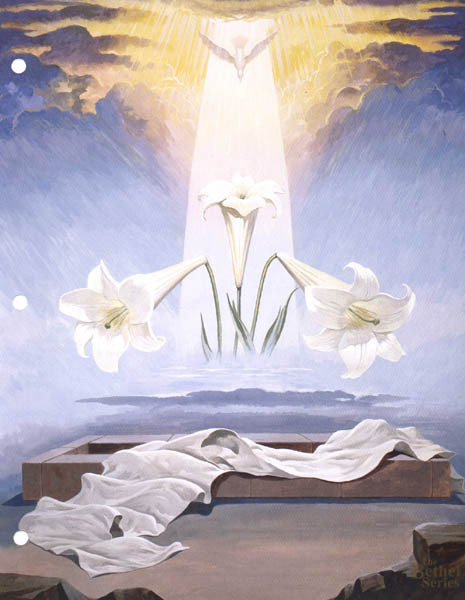 The empty tomb - Christ is risen.
" . . . the angel said to the women, 'Do not be afraid; for I know that you seek Jesus who was crucified. He is not here; for he has risen, as he said. Come, see the place where he lay. Then go quickly and tell his disciples that he has risen from the dead . . .'" (Matthew 28:5-7). The descending dove - The outpouring of the Spirit is promised.